As I write this article, we’re in the throes of the Rio Summer Olympics, so you’ll have to excuse the Olympic metaphors I’ll use into convey my message. As many of you know, I’m somewhat of a sports fanatic and the Olympic Games serve as a four year manifestation of that fanaticism. Now, even the sport novice out there knows that a gold medal symbolizes the highest achievement, whether in a sporting event or some other endeavor. It just doesn’t get any better. You’ve achieved a pinnacle of performance and beat the competition striving for that designation. You’re the best! “What is all the gold medal stuff and how does it relate to me,” you ask. Well, you are the best and you should be proud of how you responded to the ongoing transformation of our shul led by Rabbi Elkodsi since she came on board a year ago (Happy Anniversary, Rabbi). You’ve not only been there for the array of new, innovative programs introduced by the Rabbi, but you’ve played an active role in planning them and making certain they were successful. You’ve spread the word to friends and associates, helping them reach the finish line (there he goes again) of our entrance door. You’ve helped the surrounding community realize that the Malverne Jewish Center is not only alive, but is becoming more vibrant in every way. Without your involvement and gold medal performance, the enthusiasm we’re seeing in the future of our shul would not exist. So, take your place on the podium to accept your well-deserved award, and give yourself a good pat on the back as well. But, as in all sports competition and in life itself, the proof of a champion is what comes next. Will tomorrow’s performance match or improve upon what was achieved today? Look at Michael Phelps, Katie Ledecky or Simone Biles (and let’s not forget Aly Raisman), just to name the most prominent USA Olympic champions, who manage to keep setting new world records, smashing those which they previously held. Not only do they keep winning, but they do better than they’ve done before. That, my friend, will be our challenge as Rabbi Elkodsi begins her second year with us. The Rabbi and the Program Committee have just completed planning a wonderful array of enriching, diverse, innovative and even fun programs and commemorations for the coming year. These events will not only add to the value of the experience we have with our shul, but they are expected to bring nonmembers in the door as well, with the goal of eventually increasing our numbers. But to be successful and to build upon what we’ve accomplished over the past year, we need gold medal performance once again from you in the coming year. We need you to set new records of participation in the life of our shul by becoming even more involved than you have been in the past. 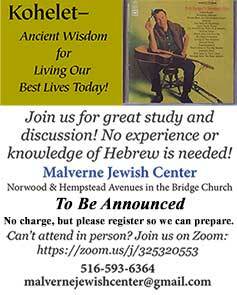 We need you to attend and work not only on programs and services that MJC holds, but to also support those sponsored and held jointly by MJC and our neighbor synagogues. Just as Michael, Katie and Simone were not totally satisfied with their past performance and responded by setting new world records, we need you to set new records of involvement with our shul. By the time you read this article, the Rio Games will be over and on its way to becoming a faint memory as other news worthy events once again dominate the front and back pages of the daily newspaper and the evening news. But what will not be forgotten will be the performances, winning and not winning, of the individual athletes who strove not only to win the event, but to keep getting better than they were before. That is how one grows, achieves and eventually reaches the status of champion. That is how the Malverne Jewish Center will continue to build upon its successes of the past year and become even better for all of us. So, fellow congregants, award yourself with a gold medal for your winning performance this past year. But please, let’s not forget the coming year and the new records for us to set.